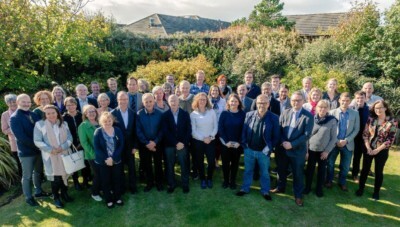 Members of the North Sea Commission’s Energy and Climate Change Group (ECCG) and the Marine Resources Group (MRG) held a joint meeting on 2-4 October in Peterhead, Aberdeenshire, with about 50 delegates. Magnus Engelbrektsson, NSC Executive Secretary, welcomed the two groups and gave a presentation on the outline and process of developing the post 2020 North Sea Region Strategy which is planned to be adopted by the NSC Annual Business Meeting in 2020. After that the two groups had their separate meetings. The ECCG discussed energy transition, renewable energy generation and climate change adaption with presentations from representatives of the Aberdeenshire Council and the organisation Pale Blue Dot. The group also discussed a position paper on how to create a level playing field for hydrogen in transport and greening of North Sea industries and European policies and funding programmes in this respect. The MRG’s agenda focused on Brexit and the connection to the fishing industry with a presentation from the Scottish Seafood Association. The presentation was followed by a discussion on the group’s action plan on marine litter, local beach clean-up projects and presentations from the East Grampian Coastal Partnership and Moray Firth Partnership. The agenda also included a site visit to the Scottish Marine Academy. The second day started with a joint visit to the new fish market in Peterhead, which is the largest fresh whitefish market of its type in Europe. The day continued with a joint meeting and presentations on marine planning from a Scottish perspective by the Head of Planning of the Aberdeenshire Council. Two innovative projects were presented, Equinor Hywind Park which is the world’s first floating windfarm park, located outside of Peterhead, and North Connect Interconnector, an on-going project which aims to generate and transmit energy between Scotland and Norway. The ECCG members continued with a NorthSEE energy workshop at the Marine Laboratory of Aberdeen.